Madhya Pradesh Results 2018: In the results announced on December 11, the Congress won 114 seats to the 230-member House, polls for which were held on November 28. The Congress will get data experts to conduct a "forensic examination" of the voting pattern in Madhya Pradesh's Vindhya region, from where it won just six out of 30 seats in the recently concluded assembly polls, as it has "suspicion" on the EVMs deployed there. The Vindhya region comprises Rewa, Satna, Singrauli, Sidhi and Anuppur districts, comprising 30 seats, of which the Congress managed to win just six seats down from the 12 it won in the 2013 polls. In the results announced on December 11, the Congress won 114 seats to the 230-member House, polls for which were held on November 28. Among the prominent Congress leaders who lost the polls from the Vindhya region are Leader of Opposition in the previous assembly Ajay Singh from Churhat and Rajendra Singh from Amarpatan. 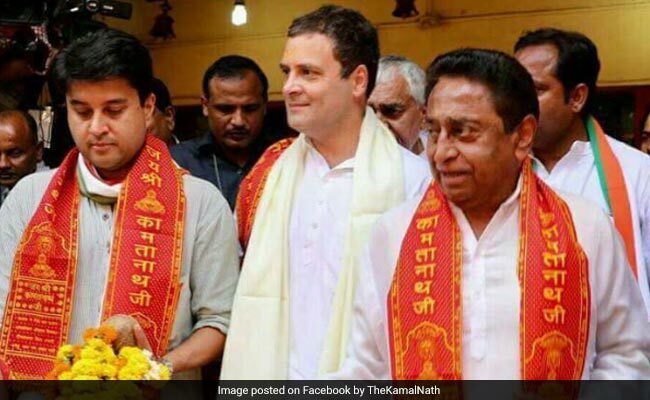 Speaking to PTI, chief minister designate Kamal Nath said, "We are conducting forensic examination of the voting pattern in the Vindhya region. Once we get it, we will talk to the Election Commission. We still have suspicion on EVMs because of results in the Vindhya region." Elaborating on the Congress' suspicions, Mr Nath said, "I have initiated a forensic examination of the voting pattern in Vindhya area just like an exit poll. People from villages told me even this morning that they had voted for the Congress but EVMs gave different results." "Don't forget that in Satna district (in the Vindhya region) the maximum number of EVM malfunctions were reported on voting day. Voting was stopped for nearly three hours. The results do not match the voting pattern of the remaining areas of Vindhya," he said. "We will deploy an independent professional agency that will go to at least 40 per cent villages and ask people for whom they voted," Mr Nath said. He added that the Congress would think of approaching courts after it received the experts' report after the forensic examination of the region's voting pattern. On the Congress' poll pledge to waive farm loans and former RBI Governor Raghuram Rajan's reported statement that such steps were not good for the economy, Mr Nath said he had a "definite plan and strategy" for the move and he would speak on it after December 17 (when he is scheduled to take oath as CM). "Just go to the internet to find out how banks have waived loans of industrialists and business houses by 40 to 50 per cent. If they (banks) can do so for them, why can't we do it for farmers?" he asked. In an apparent swipe at the former RBI chief, Mr Nath said, "Those who speak while seated in air conditioned rooms won't understand the pain of farmers. The agrarian sector constitutes about 70 per cent of the state's financial sector." "It is a fact that our agriculturists are born in debt and remain under its burden throughout their lives. Rajan does not say that waiving off loans of industry will result in a problem. Why should it be a problem when agricultural loans are waived?" Mr Nath questioned. He credited the Congress' victory in Madhya Pradesh, after a gap of 15 years, to better coordination and unity among leaders who inspired party supporters to come out and vote in large numbers. "I had a strategy in place on the drawing board for every month and after October, it was planned week-wise. This was necessary because we were against the BJP that was in power for 15 years and had a hold among every sector's employees, unions and social organisations," he added. Mr Nath will take oath Monday at a grand function at Jambooree Maidan in the presence of several top political leaders of the country.